Birthday gifts for 4 year olds, Akhil and Cyrus! Akhil’s quilt is Rainbow Stripe and Cyrus’s quilt is Boho Kilim. Made in 2017. Another finish…a block of the month featuring Bertie. The pattern had directions to make this into a quilt but I saw pillow covers instead. I made a pillow (the first block) with buttons. 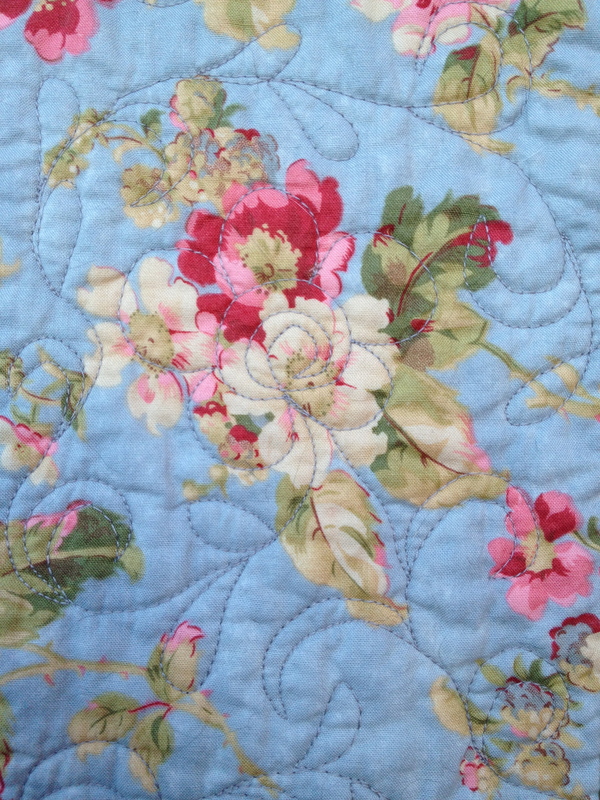 The blocks were quilted and bound individually so that I can change the pillow cover. 1-The first is a project from Instagram, a mini-hexagon quilt. It was completely hand pieced using English paper piecing. Each side of the hexagon in 1/2″ long. 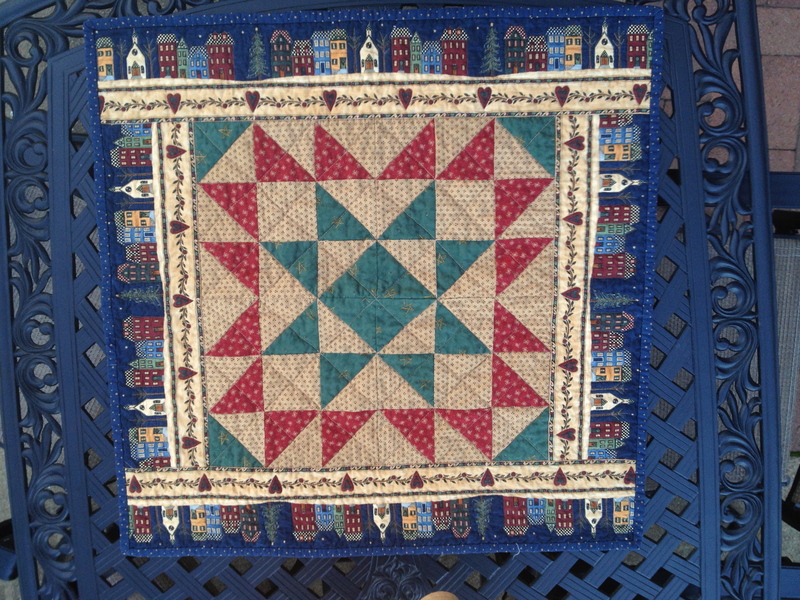 This minature is a reproduction of an antique quilt. 2- 2015 12 days of Christmas freebie. Each block is 3 inch and assembled into a small runner. 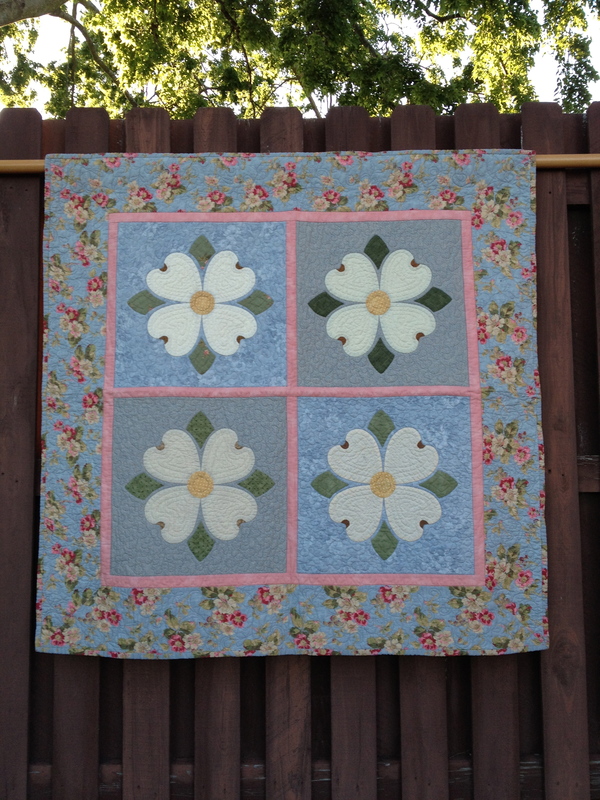 3- another freebie from Temecula using Judie Rothermel Civil War reproduction fabrics. 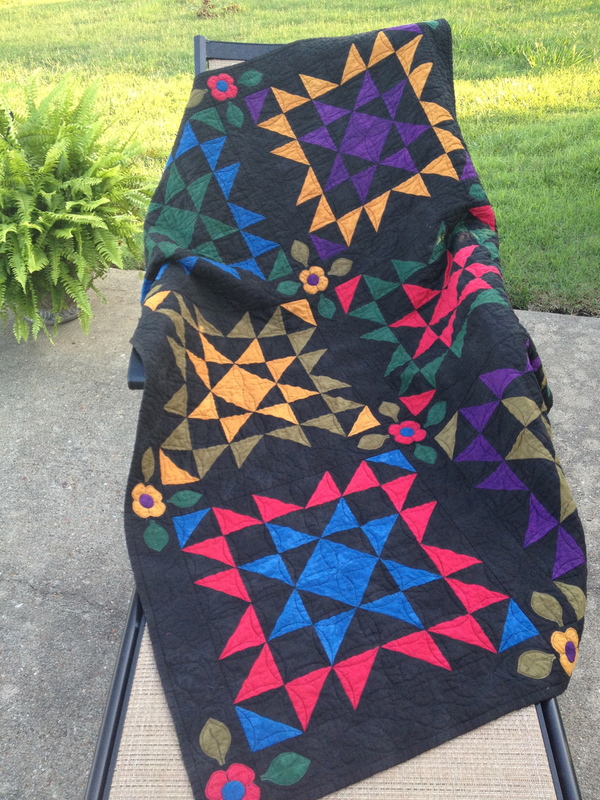 I had forgotten all about it until I was looking for a candidate to use as my FIRST ever longarm quilting project. 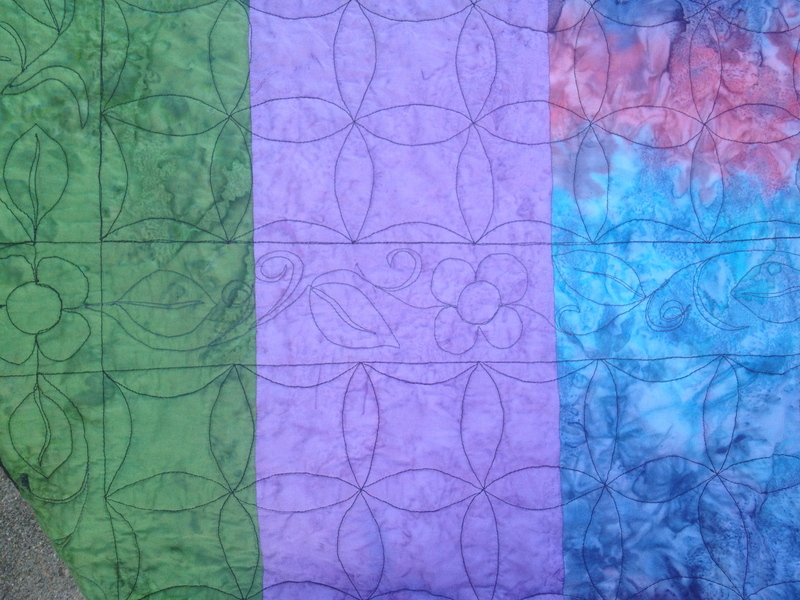 The fabrics are pretty busy and therefore extremely forgiving with less than perfect pantograph quilting. 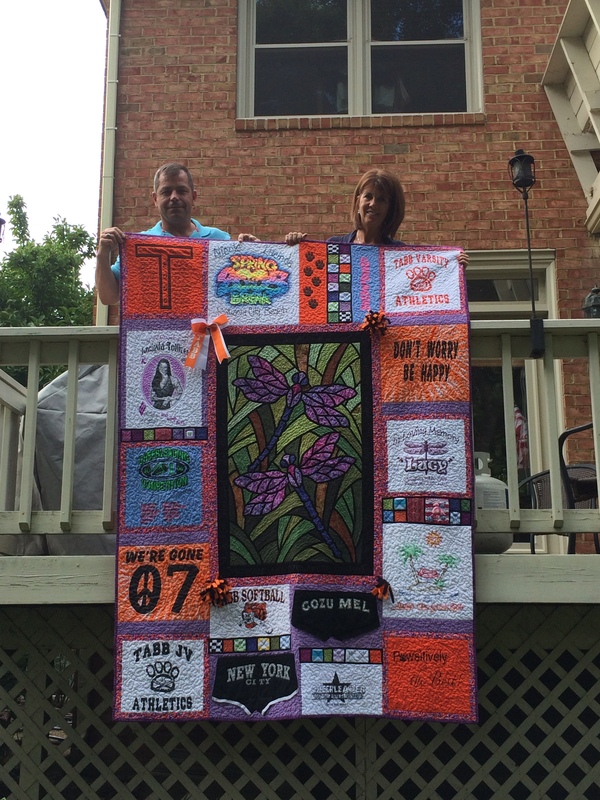 This is a memory quilt I made for our friends Bonnie and Wade. Their daughter, Lucinda, passed away in December 2007 at the age of 19. I made this quilt with them using Lucinda’s favorite t-shirts, shorts, socks, scarf. 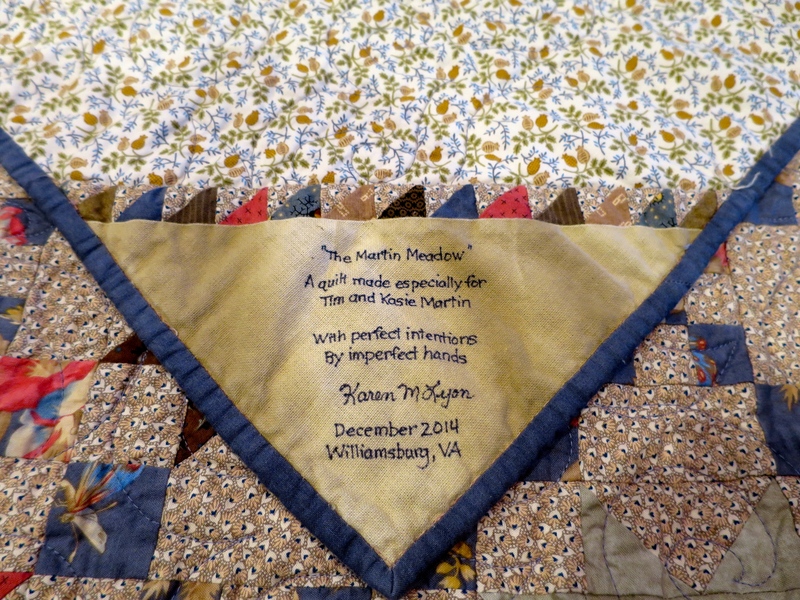 It was a great joy to gift them this quilt. 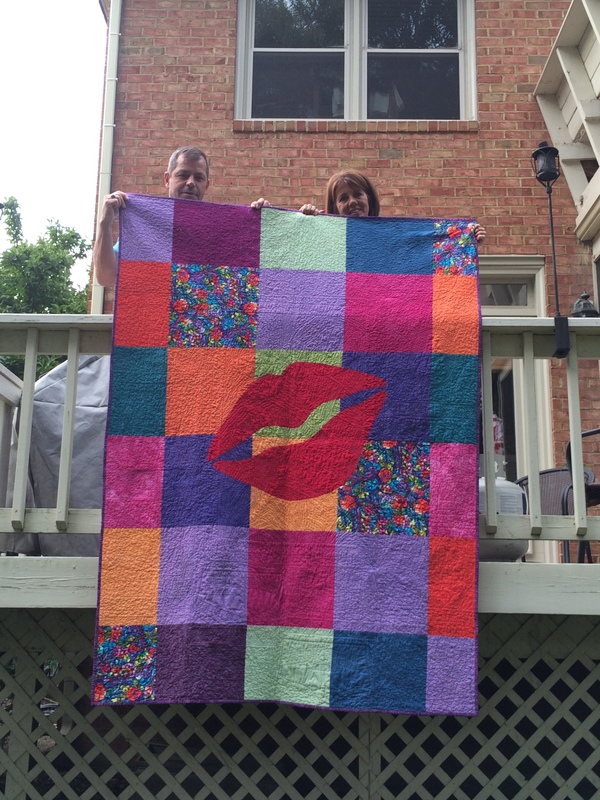 Over the years I have enjoyed participating in Block of the Month quilts. I think Jan Patek’s were some of the first that I did. The catch with doing them is making sure you aren’t doing multiples at a time. It’s easy to get behind and difficult to get caught up. There are a ton of really great patterns out there too so it is hard to choose. Over the past few years I’ve sworn them off, mainly because I have one or two in my quilting queue just waiting for me to get motivated! 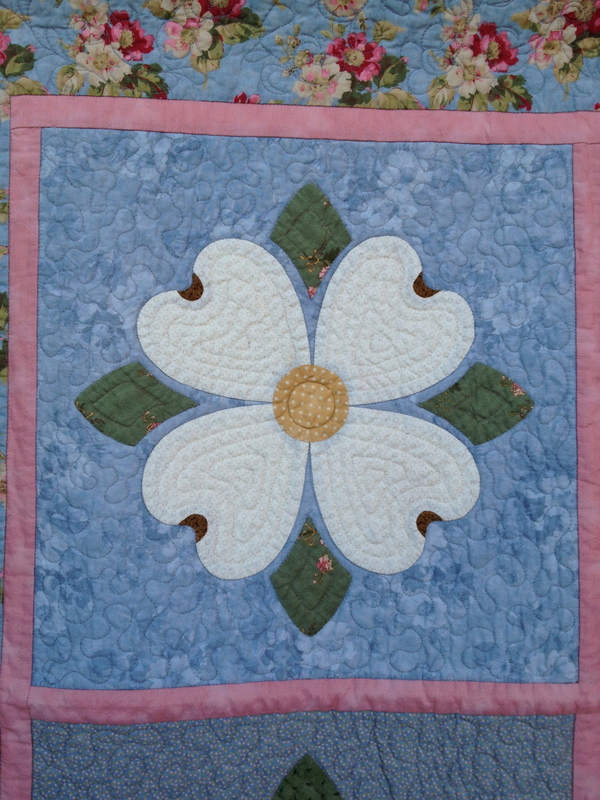 Several months ago I quite by accident came across the Temecula Quilt Company website. I love their style and they specialize in Civil War fabrics and smaller quilts. So I’m a frequent stalker of their website as well as a customer now. I decided to bite the bullet and try one of their block of the months using solid fabrics, making 5 blocks a month, each 5″ square. Now 3 months into it, I am proud to say I’m not behind….yet! To help keep me on track with the project I decided to display my blocks so that I can always see them. A piece of jute twine is strung just below the crown molding of my sewing room and using lots of tiny clothes pins from Michael’s I have one side of the room lined with 15, 5″ squares. The patterns we are using to do these blocks are Lori Smith’s, Road to Freedom. I will be updating you on my progress in a few more months when the next wall is full! 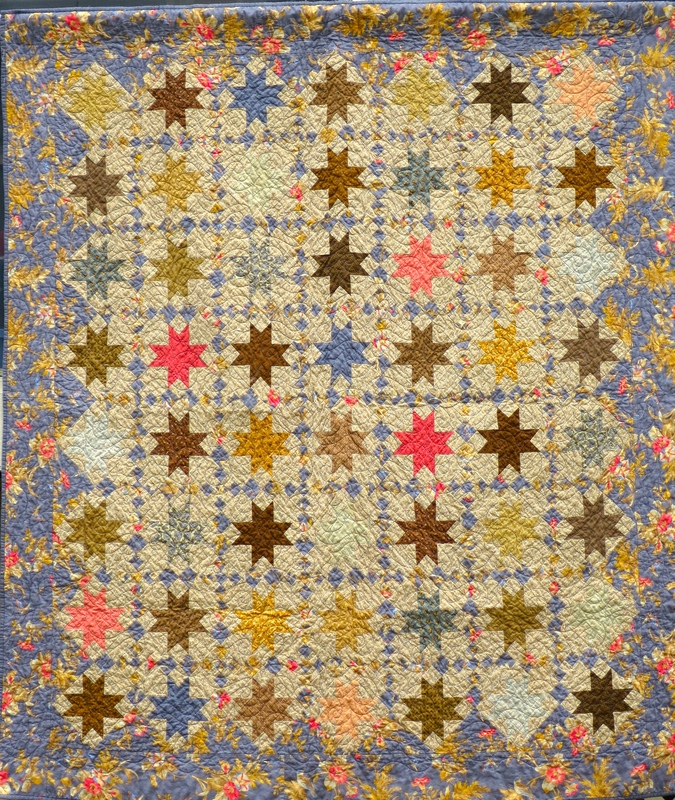 Elfriede’s Stars…this is a small tabletopper made from Civil War fabrics and a gift to our German landlords, Walter and Elfriede Goettel. They are lovely people and welcomed our family with open arms some 20 years ago. My husband had a business trip to their area this summer and arranged to visit with them. 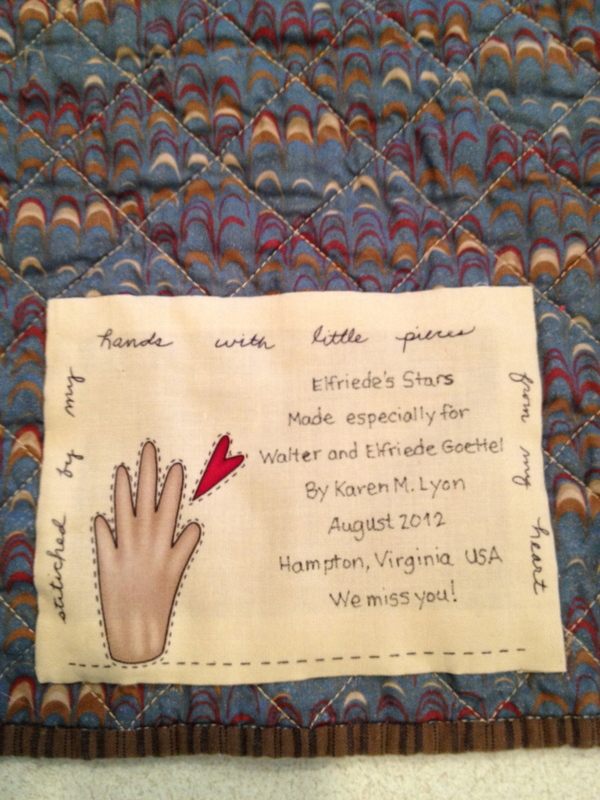 I made this for them and later received not one but two phone calls from Elfriede. Our phone conversations are very interesting now…my German is dusty from being in the attic for nearly 20 years but I’m amazed at how much I still understand. Needless to say she was thrilled with this small gift. 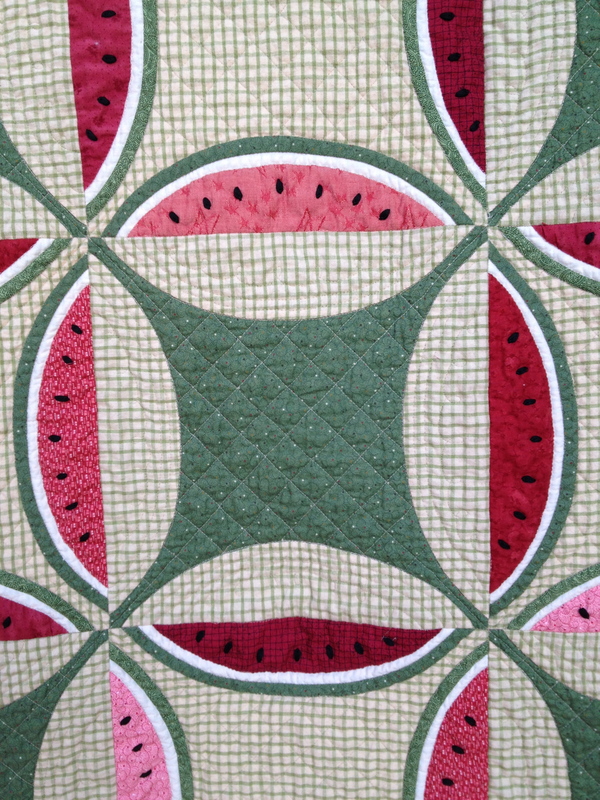 This is the pattern I used for the beginning quilt class. 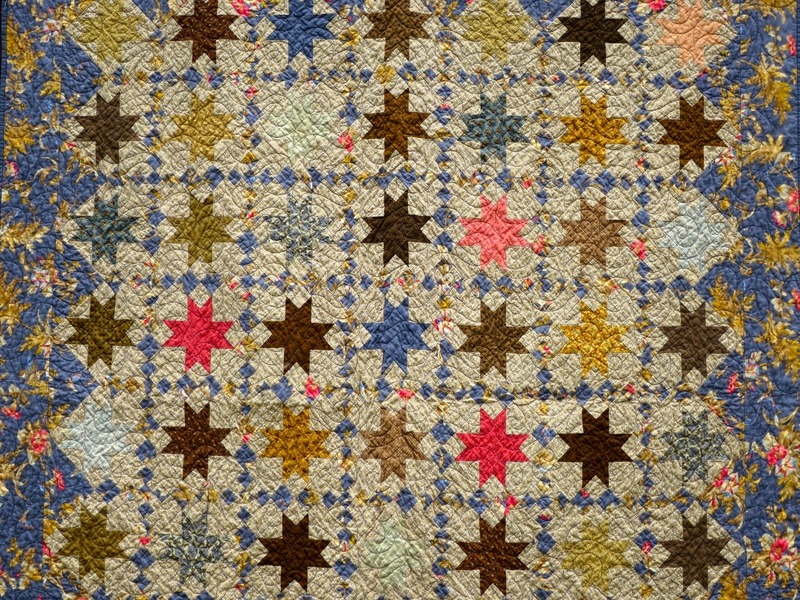 Half square triangles in an extended star pattern. This is a single block in a Christmas theme and then there is…. 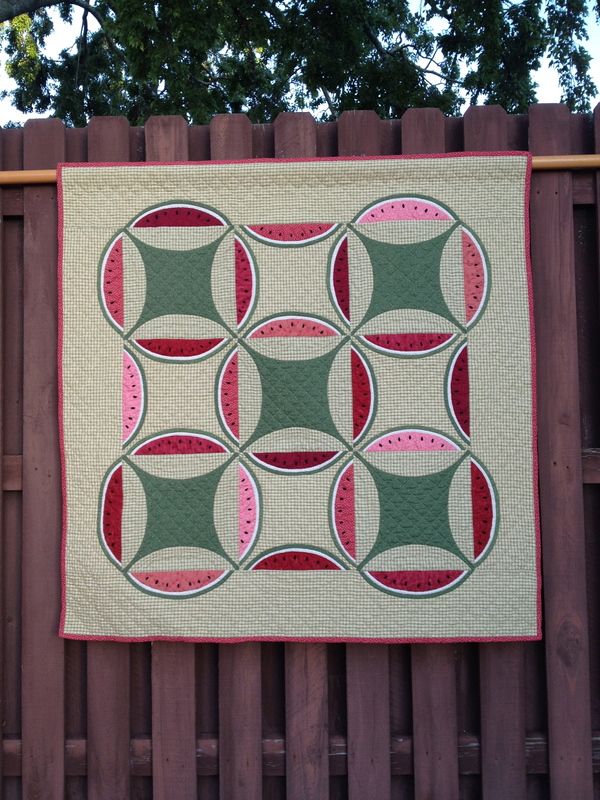 a 6 block version that makes a lap size quilt. 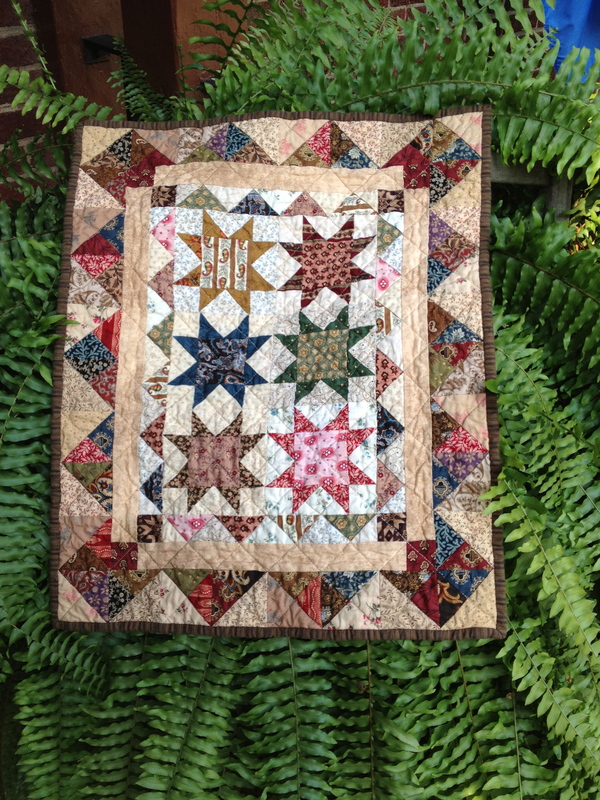 This is called Amish Stars and I used hand dyed solids from Cottonwood Fabrics to make this quilt. It does have a little appliqued flower and leaves in the cornerstones. I had some batik fabrics that I pieced for the backing and here you can see the pumpkin seed quilting and flower & vine that I free motion quilted. 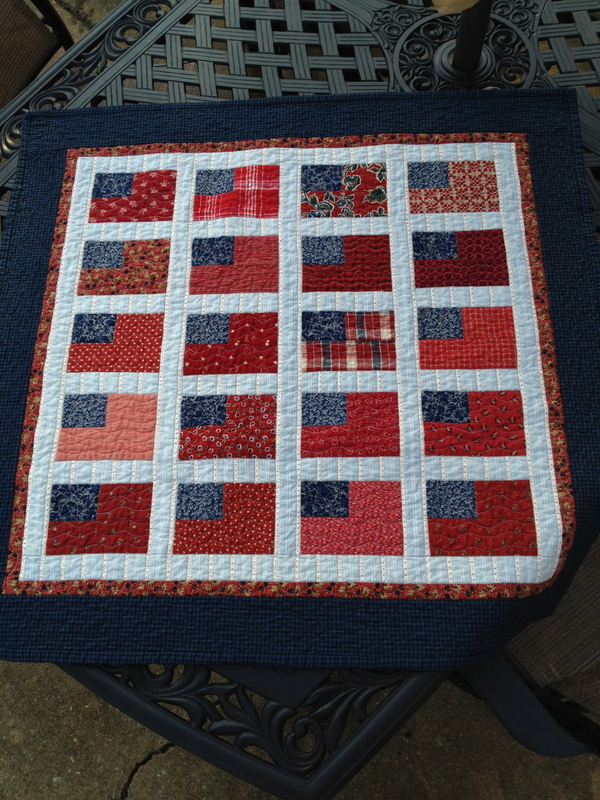 “Flag Day” was inspired by a quilt I saw on Pinterest and I knew I had the perfect fabrics for this quilt. I need to do a close up picture because I love the shirting fabric I used in the sashing and I like the quilting I did on it. I honestly love this quilt and it was a quick one to machine quilt! I’m in the process of making my UFO completion list for the Fall. Wish me luck!! One of my favorite drives in Spring is the Colonial Parkway between Williamsburg, VA and Yorktown, VA. This year was no exception. 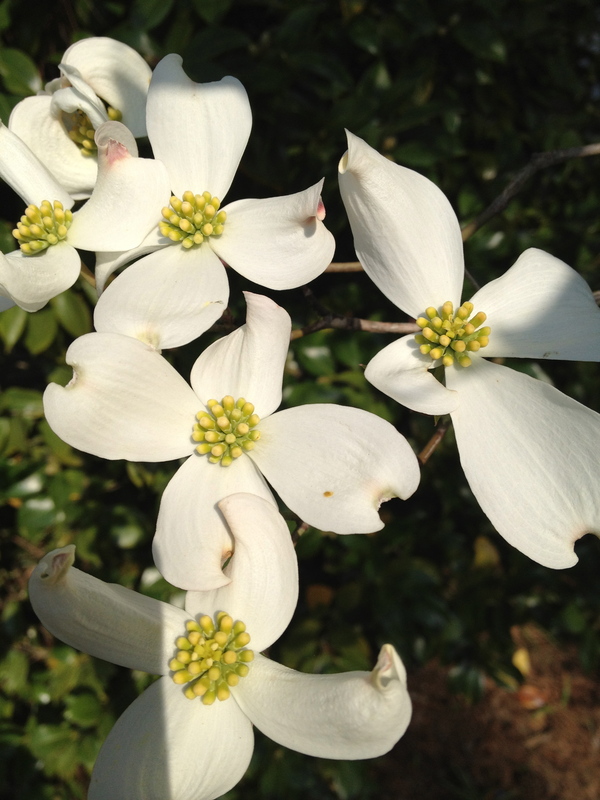 The dogwoods are just beautiful and inspiring. 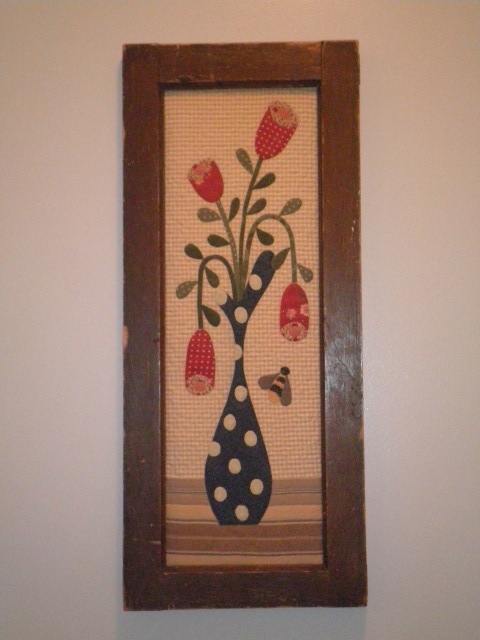 “Polish Pottery” framed quiltlet in a vintage transom window. Making this folkart quilt brought back memories of a bus trip to Poland with our squadron spouses. It was an incredibly fun time and I bought Polish pottery like I would never see it again.